In the last weeks, I got the Question a few times, that the App-V Sequencer is missing from the Assessment and Deployment Toolkit (ADK) 10 v1607. 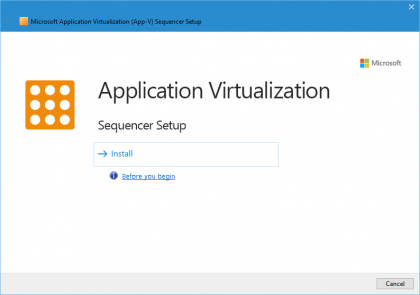 For those of you who don’t know, starting with the ADK 10 v1607, Microsoft integrated the Application Virtualization (App-V) Sequencer due to the fact, that App-V was natively embedded into Windows 10 v1607. The reason for this was Project Centennial. 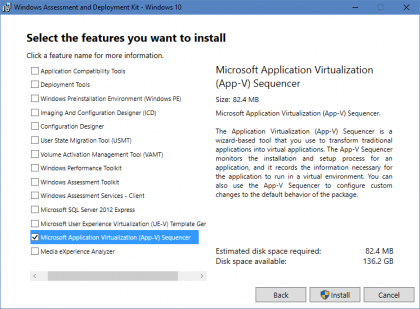 Now, if you’re going to launch the ADK 10 v1607 on a Windows 10 v1607 Operating System, you will find the Installation Option for the App-V Sequencer in the ADK Setup Wizard, as you would expect it. However, sometimes you actually get the following picture when installing the ADK 10 v1607, where the App-V Sequencer option is actually not there. Now the key thing here, is actually Windows 10 v1607. During my tests, the Installation Option was only visible, and thus selectable, when the ADK Installer was ran, on a Windows 10 v1607. In all lower OS Versions, including Windows 10 v1511/v1507, Windows 8.1, Windows 7 and Server 2012 R2, the Option is actually not visible. 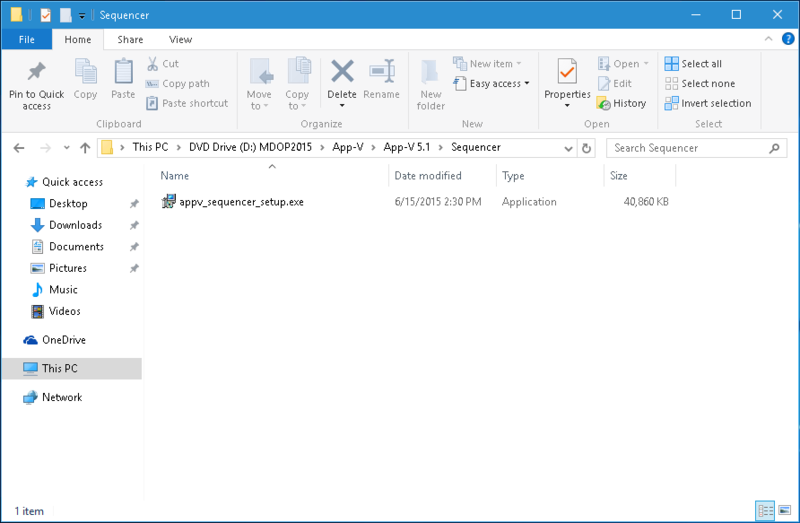 If you want to install the App-V Sequencer on those older Operating Systems, you actually need to go the traditional way, via the Desktop Optimization Pack (MDOP) 2015 Setup Media. 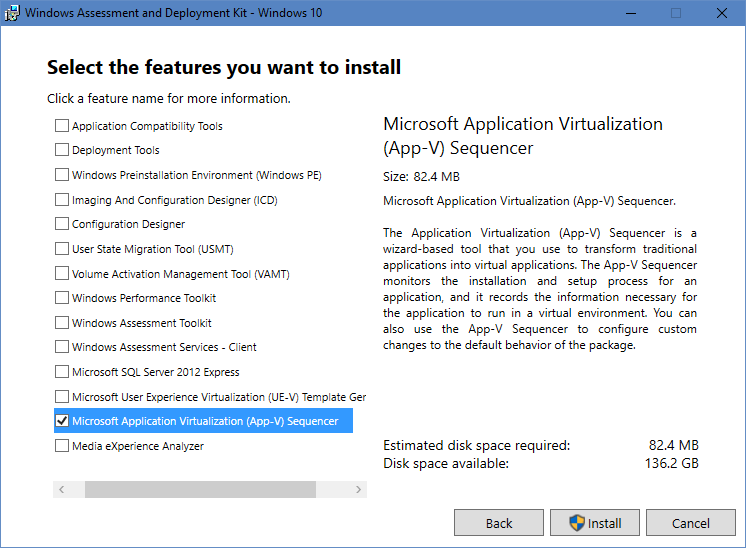 The App-V Sequencer Installer in the ADK 10 v1607 is actually the same one, that you’ll find in the MDOP 2015 Media. Both are on Version 5.1. Working in Switzerland as a Systems and Desktop Engineer, Simon Dettling’s focus lies on Client- and Application Management, using Products like System Center Configuration Manager, Microsoft Deployment Toolkit and Application Virtualization (App-V). Besides blogging, he’s frequently moderating and answering posts in the Microsoft TechNet Forums, mainly in the App-V and ConfigMgr sections. 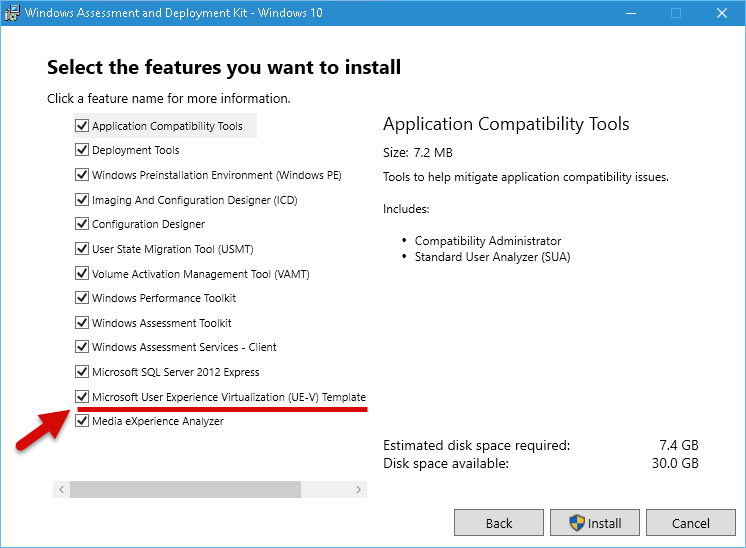 We can only install APP-V Seq 5.1 application through ADK v1067 (https://developer.microsoft.com/en-us/windows/hardware/windows-assessment-deployment-kit) In Windows 10 1607 right! Yes and for Server 2016 as well. Hello! I am relatively new to App-V (I come from msi packaging land), so I apologize if this is a dumb question. We are about to rollout to Windows 10 in my environment. So, given that App-v client is embedded in Windows 10, and, that the app-v sequencer can now be obtained through ADK 10, I am wondering, is it necessary to have the App-v management server at all? We already have SCCM as software distribution solution. It seems to me that we could just use the app sequencer to create app-v packages, and then use SCCM to install them to clients. To me, this seems like a logical extension of what we have traditionally been doing with msi repackaging, except now the packages will just be app-v.
Am I missing something here, or is it really as simple as that? 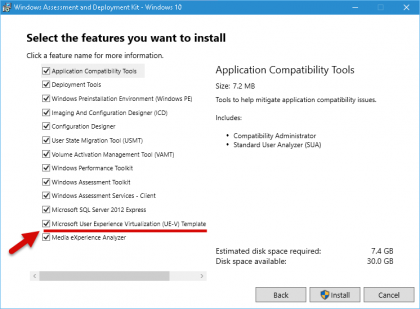 Why would we need App-v management server at all if we already have SCCM? It just seems to me like another type of distribution method? App-V Packages can be deployed using the native Full Infrastructure or ConfigMgr or you can do it manually by using PowerShell. In fact ConfigMgr also uses the PowerShell Cmdlets to publish the Packages. This only applies to Windows 10 1607 or later. For Windows 7, 8.1, 10 1507/1511 you need to manually install the App-V Client from the MDOP ISO. Thanks Simon for quick response. If you have any link where i can download particular MDOP and App-V client setup.exe for Windows 8.1 its really helpful for me… i am trying from last 2 weeks but not able to find any solution.